Many people (including yours truly) who are at least old enough to have college-age children are walking around with “medals of valor” in their mouths, reflective of a dental age gone by. These “medals” or actually “metals” that I playfully refer to are of course silver-mercury amalgam fillings. Silver-mercury amalgam was the mainstay of restorative dentistry for generations long before the advent of dental bonding and protective occlusal sealants. Amalgam fillings predate water fluoridation, which began in earnest in the 1950’s (and no, fluoridation was not some Communist plot to poison Americans as some had theorized!). In those days, was not uncommon for a child to come from the dentist’s office with the news of five or six cavities, each of which would subsequently be treated and restored with silver-mercury amalgam. While I don’t mean this in a pejorative way, “drill-and-fill” was a common moniker for that process of treating cavities. Quite a few of us baby boomers are walking around with veritable mouthfuls of silver-mercury amalgam fillings. But times have changed. Thanks to preventive dentistry, healthier diets, and the aforementioned fluoride and sealants, numerous teenagers and young adults have never had a single cavity! But there have been recent reports, such as the one cited in this New York Times article, A Closer Look at Teeth May Mean More Fillings, that heretofore pristine mouths are being diagnosed and treated for a condition (I use the term loosely) called “microcavities”. “Microcavities” are not a new phenomenon. In fact, they are essentially a very early stage of the tooth decay process that may or may not develop into a full-blown cavity. Today’s “microcavities” are what dentists have for decades referred to as incipient caries, or to put it more simply, “surface cavities”. A cavity begins with a bacteria-induced acid attack of the enamel surface of a tooth (enamel is the hardest substance in the body). If this acid attack persists, pitting and softening of the tooth structure occurs and renders it susceptible to breakdown. Thus a cavity is born. But incipient caries affect only the enamel of the tooth. They are superficial and do not penetrate beyond the outer half of the tooth’s protective enamel. Incipient caries can be treated with fluoride to re-mineralize the tooth structure and reverse the destruction, thus eliminating the need for a filling. As mentioned before, not all incipient caries will progress to true cavities. Good clinical judgment is required to make the right decision. “To treat or not to treat, that is the question! Sometimes watchful waiting (along with dietary counseling and fluoride application) is the most prudent course of action. New technologies can help with monitoring and aid in treatment decisions and one such development is Diagnodent, a diagnostic laser that can measure the relative depth and progression of a cavity. 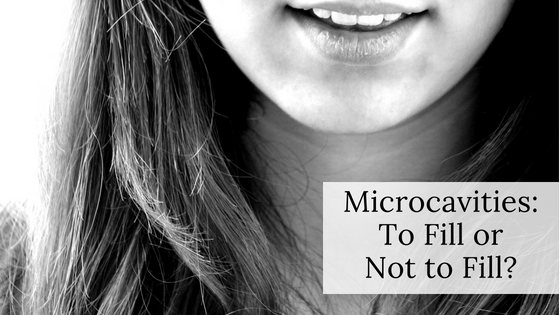 Unfortunately, many of the so-called “microcavities” are being rushed into treatment with fillings. What’s important is this: once a filling is placed into a tooth, the greater the likelihood that the filling will need to be replaced someday. So, remember, all cavities are not the same. If you are diagnosed with an uncharacteristically large number of cavities, ask questions! While it is not uncommon to see your kids go off to college with perfect teeth and come back with their first cavities (blame it on increased sugar and junk food intake accompanied by a slackening in oral home care) I fear that the “discovery” of “microcavities” has led to over-treatment of what is often a reversible condition. I recently switched dentists only because their hours were easier for my schedule. I went in for a cleaning and exam, come to find out I have 11 cavities. This is shocking to me. I have no tooth pain. They used a laser and digital imaging. 4 of the cavities are say resin-two surfaces-anterior. The others say composite. Are the 4 cavities surface cavities? And I find this strange because I saw my normal dentist 6 months ago and I was fine. Of course there is no way I can determine what just occurred during your recent dental adventure (or misadventure!). Eleven needed restorations is a significant finding and the disparity between the two dentists raises obvious questions. You perhaps should confer with your first dentist for a second opinion. Good luck! Hi, I have never had a cavity until apparently now and I am 18 years old. I got my braves off about 8 months ago (after having them on for 7 years) and my dentist told me that I didn’t have a cavity or anything but I should get a filling just in case. (Was told that when I was much younger too). I just returned from the orthodontist (4 months after the dentist) and during a check he told me I had a cavity! I’ve taken much better care of my teeth.. I don’t drink sodas and have a fairly healthy, balanced diet. I brush and floss.. Everything. I don’t understand what could have caused a cavity in a matter of months.. My teeth feel fine. Don’t grieve the loss of your dental innocence. Having a filling placed will not diminish your overall dental health and taking care of your cavity is a must. You did nothing wrong and in fact, it sounds like you are doing everything right. So allow me to interpret the situation. You did not form a cavity in four months; it’s obviously been developing for a while. Your dentist telling you that you didn’t have a cavity but that he wanted to place a filling “just in case” is curious. Taking the high road and giving him the benefit of the doubt, I suspect that your tooth had some sort of defect in the enamel that he wanted to seal before it became a full blown cavity. Calling such this defect a cavity or an area demineralized tooth structure or even a blemish may be just a matter of semantics. Not addressing the problem at all is far more egregious. Many times, depending upon where a cavity is located, it is possible to monitor with x-ray if the cavity is on the side of the tooth or with a diagnostic laser if it’s on the biting surface. Diagnodent is a diagnostic laser that can gauge how deep a biting surface cavity is and helps in deciding whether it needs to be treated immediately or possibly be remineralized with fluoride treatment. I believe that between what your orthodontist told you and what your dentist tried to tell you, you should make the appointment to treat your “cavity.” From the sounds of it, you are very conscientious with your dental home care. Wearing braces for seven years (which is quite a long time) can put your teeth at greater risk for cavity formation. I salute you for your diligence and have to give credit to both your dentist and orthodontist for keeping you in fine dental form. Take care of your cavity as soon as possible and don’t fret too much (this is not the beginning of the end.) A beautifully placed bonded restoration (filling) will secure your tooth’s health and will be virtually invisible. Keep up the good work.